Adrian Jack has now retired from public life and compositional activity owing to ill health. Many of his scores and some recordings are to be found in the BMIC Collection. Thorson & Thurber will be performing three of his two-piano pieces in 2018. The Song Company performed A Winter Warmer eleven times on their Lully Lulla tour in 2017. 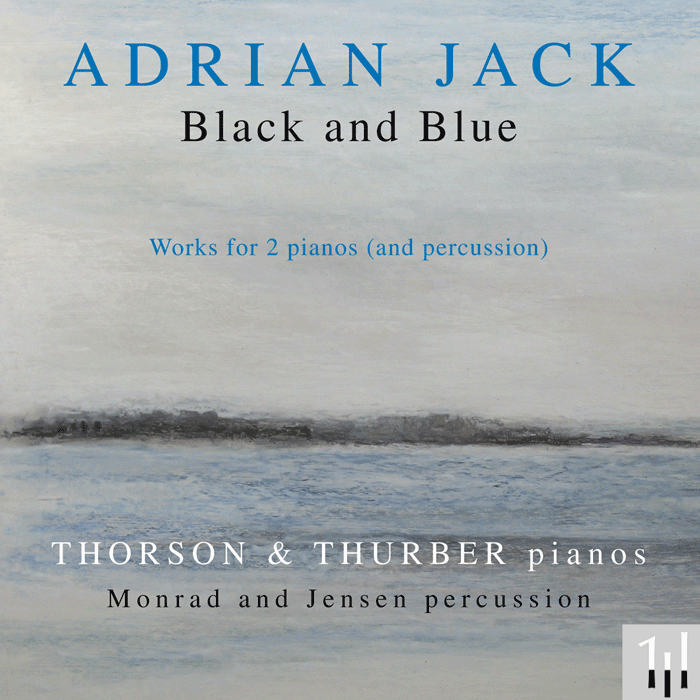 Black and Blue is the title of one of Adrian Jack's pieces for two pianos and the name of his new disc containing all eleven pieces he has written for the medium. The disc traces the course, over some fifteen years, of Jack's artistic collaboration with Ingryd Thorson and Julian Thurber, whose enthusiasm and encouragement - not to mention their superb performances - were his main inspiration. The character of the pieces (arranged in the order of composition) ranges from the belligerent to the serene, and each was to some extent a reaction or response to the one before it, so that the listener experiences a kind of journey when following the eleven tracks one after the other. This album is now available from 1equalmusic or as a download from iTunes. Click here to purchase the album on 1equalmusic. 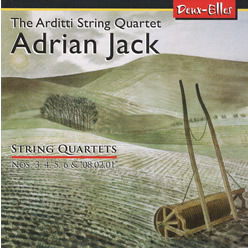 Adrian Jack's String Quartets (Nos. 3, 4, 5, 6, & "08.02.01") released on Deux-Elles (02/10/2006), in a new recording by The Arditti String Quartet, catalogue number DXL 1116. Click here to purchase the disc via the Deux-Elles website. "Adrian Jack is probably best known as a critic, and best remembered as the deeply discerning and quietly persuasive curator, as one would now say, of concerts that introduced London audiences to the music of Lachenmann, Scelsi, Goeyvaerts and many more..."
Im rather amazed that those comments are five years old, but utterly delighted that Deux-Elles (whether spurred on by my challenge or, as I sus	ot) has recorded Jacks most recent quartets and issued them on this very welcome disc. Click here to purchase the CD via the Deux-Elles website.